In the old days of RapidWeaver themes, banner and header containers were typically formed out of a box container with a CSS background applied. Although these worked okay, they could not resize easily on different screen sizes (due to fixed height or width settings applied) and typically you could only apply static images. It became clear that many RapidWeaver users wanted greater freedom and flexibility; after all the page header or banner is one of the most important parts of a page and often the first thing website visitors see. The term 'FreeStyle' was coined by a ThemeFlood customer, who discussed the need for "a more free-style approach to theme banners and greater flexibility with what you can do in them". FreeStyle should not be confused with a series of RapidWeaver themes from another company, also called 'Free Style'. There are several different ways to use FreeStyle and get attractive banners setup in your websites. Some of the methods outlined are ideal for novice RapidWeaver users wanting to avoid complicated code or configuration, whereas other methods will appeal more towards users seeking to warehouse static images or setup a greater number of custom banners within a project. If one of the above (named) images is seen in the content or sidebar region, it will be moved into the FreeStyle container. No additional code or configuration is required. The second method is to toggle-on the Preview ExtraContent Containers option in the theme Miscellaneous style settings. Look for the designated ExtraContent container marked 'FreeStyle Banner' or 'FreeStyle Header' in red text (or any other area advertised as being a banner, header or slideshow region). Then use the standard ExtraContent code snippet or ExtraContent stack to place images or other content into that numbered ExtraContent container. ExtraContent is already discussed in detail in this theme user guide. If you like using the Stacks plugin, then you should definitely try the free ExtraContent Plus stack, or the FreeStyle stack (pictured below). This will let you setup a range of different FreeStyle banner types, including static images, sliders and video. The stack consists of clear instructions and various 'templates' relating to the type of content you intend on setting up in your FreeStyle banners. In the above pathto example, incrementing the number of the image (e.g. 1.jpg), will change the image displayed. So 4.jpg would display a different image. These code snippets can be saved in RapidWeaver for quick future use. The alt='' attribute you see in the image tag can be used to provide a description about your image to search engines and social media services. When a FreeStyle-enabled theme sees the 'fs' code, it knows to treat that as content for the FreeStyle container. It's hoped that this new FreeStyle concept will give control of theme banners and headers back to theme users again, and help streamline developer workflows. All modern web browsers will then reserve a space (equal to the dimensions you specify) for the image to load in, which will reduce shifts occurring during and after page rendering. Quite a few web browsers will even go ahead and calculate responsive scaling, before the image has finished loading. So this can be a useful trick to know about. Many of the example demo sites published on the ThemeFlood website are using examples of FreeStyle banners. When you download these project files using the links provided on the website, you can see how the FreeStyle banners were configured on each page. Typically we use the HTML code snippets discussed above to display static images, and these code snippets can typically be seen in the main content or sidebar regions, in RapidWeaver edit mode. As always, any custom code being used to setup or modify theme graphics should not be pasted into the RapidWeaver Custom Header box, in the page inspector. This input box is reserved for code you need to put in the page header, above the visible section of the page. Putting content code in here risks breaking the page or creating other problems. Typically the FreeStyle banner code discussed above is best to put directly into a page content container or sidebar (even if the container has been set to hide). 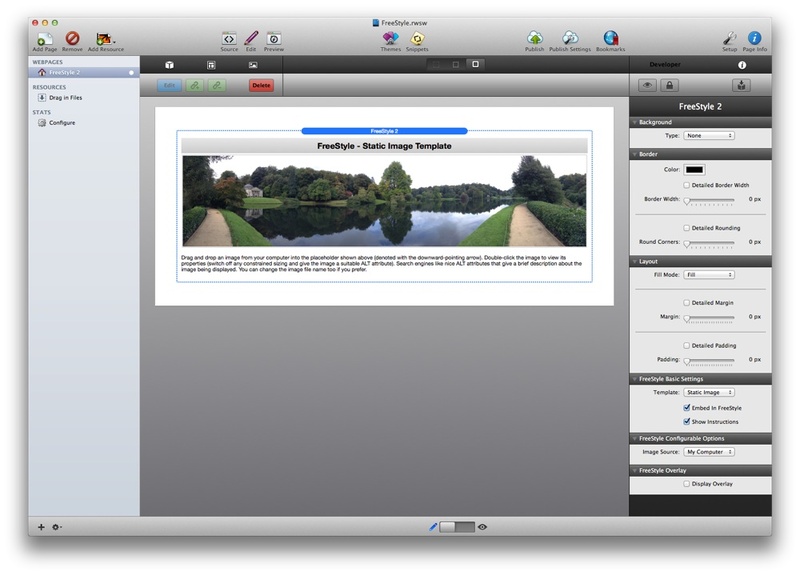 RapidWeaver 7 introduced the ability to drag and drop images into a banner placeholder (within the site setup or page inspector). This feature is enabled in all the latest versions of ThemeFlood themes. This is by-far the easiest method for quickly embedding static images within your theme banner region. For banner images dragged and dropped into RapidWeaver 7, the RapidWeaver site setup displays the recommend size of banner images (below the drop-zone). These are provided just for rough guidance and your are always welcome to provide images of your own size or shape. In most themes, the banner automatically resizes to fit the images you provide. 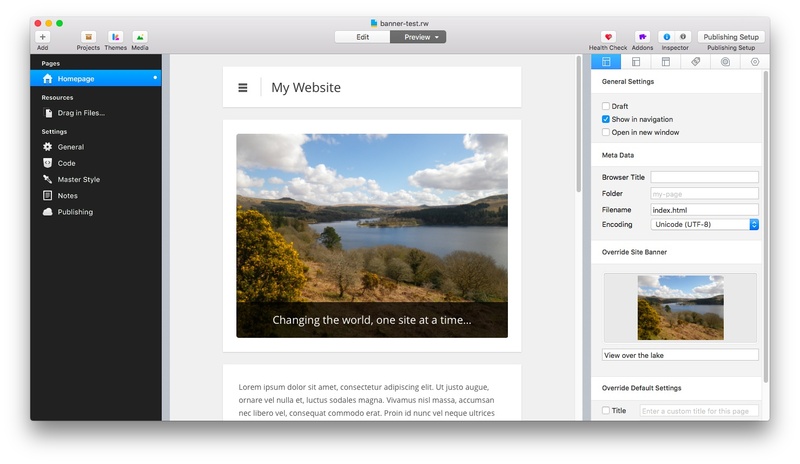 If using images dragged and dropped into RapidWeaver 7, the option is also given to provide an ALT attribute. The ALT attribute (alternative text) comprises of a short description explaining what the image is about. As well as being of significant benefit to search engines (that can't see your images) the ALT attribute is also used by visually-impaired website users; to get a spoken description about the image they can't see.